The philosophy when designing our steering systems was to make robust, reliable equipment, which can be serviced or overhauled by a person with moderate mechanical skills and limited facilities (in other words, fixed by a member of the crew, working onboard the vessel). Selecting and installing a steering system is not straightforward; buying the equipment from one company, designing mounting brackets and fittings so that the system can be installed into the boat, having them made, installing the system, interfacing with an autohelm etc, can all be time consuming and challenging. We can help to remove this burden, by installing a complete system. We are also happy to sell all of the necessary parts, for a customer to undertake their own installation. We have designed bevel geard, cable and chain, rod linkage and tiller based mechanical steering arrangements. Please contact us to discuss your requirements using the contact details above. The gear arrangement shown above forms the basis of our hydraulic helm. Supplied within a gearbox, designed to be mounted in a number of different orientations, the helm input shaft, which drives the pinion to the left hand side in this view, is rotated in order to drive the rack, which is attached to a hydraukic cylinder. This aligns with our philosophy of using simple solutions that can be maintained, and if necessary repaired, by a person with relatively limited mechanical knowledge or fitting skills. This device is bolted to a wheel, and allows the wheel to be diengaged so that it spins freely when not in use, for example when an auto-helm is operating and it is desirable for safety reasons to uncouple the helm. The multi-plate caged clutch assembly is made from stainless steel and bronze, providing corrosion resistance and exceptional performance, with only relatively moderate tightening of the assembly required, to change from no drive, to a reliably functioning helm. 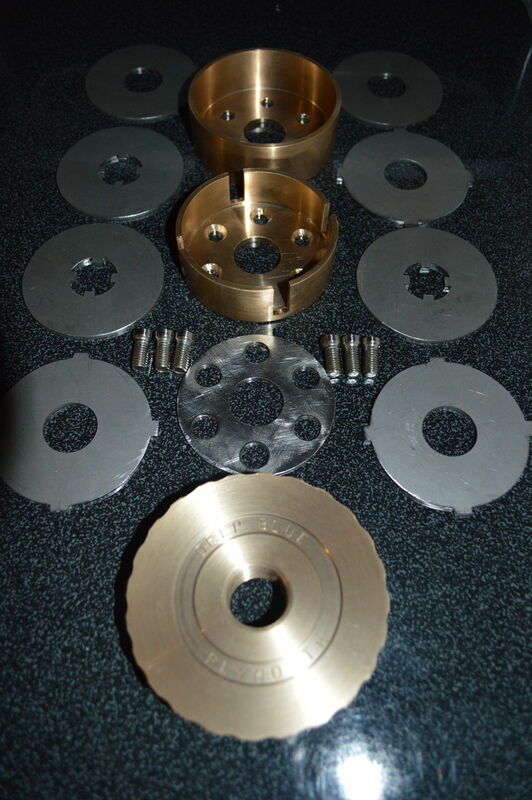 These units are made in two sizes, at 75 mm diamter and 100 mm diameter. The diameter refers to the outside diameter of the housing. The smaller units are suitable for use on vessels up to 15 tonnes displacement and the larger unit will be suitable for vessels of up to 45 tonnes, assuming a 6 turns of the wheel = full rudder travel.